Capricorn is in charge of skeletal system and bones. This sign obtain great skeletal and muscular constitution. Health picture: Capricorn is one of the signs that can be described as endurable. However, the weakest areas are bones and skeletal system of Capricorn. Pains in joints and bones, sensitive to weather and mechanic traumas knees, rheumatism, aches, swelling limbs and so on – is only a part of possible diseases of Capricorns. Saturn is a planet that governs Capricorn. Saturn is associated with everything made of bones in our body. Capricorn's skin always needs moisturizing and delicate care routine. Capricorn should beware of drinking, as they are very sensitive to this kind of addiction. They overuse and overindulge themselves with alcohol. They lack of food organization, because they can be hungry all day and at the end of the day eat everything they've found in the fridge. Capricorn's biological cell salt is calcium phosphate. It is responsible for healthy bone building. Eating tips: Insufficient amount of this mineral causes different diseases of bones, like osteochondrosis, teeth problems, rachiocampsis, pains in knees, toes and joints. 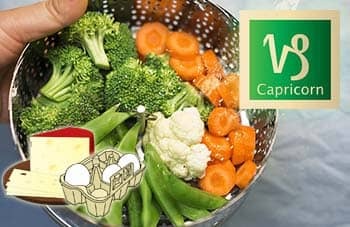 Calcium phosphate can be found in spinach, celery, cabbage, carrot, nuts, broccoli, wheat, corn, citruses, grapes, oats, and potato. 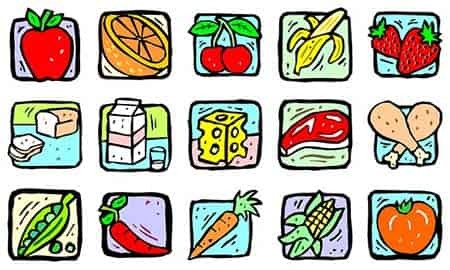 Proteins can be found in poultry, fresh fruits, steamed veggies, greens are very recommended for Capricorn, as it can help avoid unpleasant consequences. Calcium can be found in dairy and especially cheeses, which can help to reduce problems with teeth. 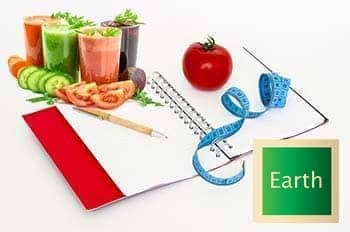 Every day diet should include proteins, vegetables, fruits (seasonal), eggs and yogurts. Avoid: Don't eat one meal many times in a row, experiment with your diet, diversify it and keep everything in balance. It is normal to have food preferences, but our organism needs different substances from different food to operate normally. Chocolate and refined sugar should be used in moderate amounts as they cause skin eruptions and irritations. It is better to avoid spicy and heavy seasoned food, as it causes upset stomach for a Capricorn. Earth signs are apt to have weight issues, developing tumors, and high risk of glandular disorders. Generally they tend to pamper themselves with food, so obesity and improper diet are main causes of their problems.